We all know Halloween is half for the chocolate and candy companies and half for us. This one is a bit of both. 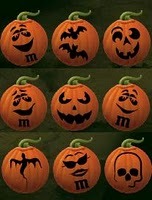 Mars (and all of their subsidiary chocolate) are giving away free Pumpkin stencil kits. Basically you go to their website, select the scary face you want from their list, then they give you a pdf you can then print and stick to your pumpkin to carve, (or just leave it there) to have a nice scary pumpkin.